In 2015 and 2016, we held RiverCon, and it was a great success, very much due to you, and everyone else who became involved! We're starting our process of setting up for the 2018 RiverCon, which will hopefully be even better than the one before. RiverCon 2018 will take place on April 28th, from 1pm-6pm. We hope you will consider joining us again! Please let us know if the 501st will be interested. 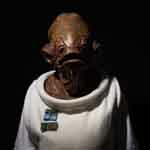 I am tentative for trooping this as Ackbar for a couple of hours- from about 1 PM - 3 PM. I made it out to this yesterday as Admiral Ackbar- it was a fun event with friendly kids and hosts. Damon Degner was there in his Tusken Raider and with his R2 unit, and Tyler Ellis and Justin Horn were there from the 501st.